DutchCountryPantry.com, specializing in Wet-Bottom Shoofly Pie and Birch Beer, is a subsidiary of PaDutch.tel and is owned by Lonnie & Shannon Kauffman, who live in the middle of Pennsylvania's Lancaster County. The business was formed in 2008 and has always sold Pennsylvania Dutch Country foods known for taste, style, and quality. They enjoy selling these Amish style foods because they enjoy eating these foods as much as anyone else! This site has so many great items form PA Dutch Country. My family and I were very fortunate to be able to try out a few of the great items, including the famous Wet-BottomShoofly Pie the Cope'sDried Sweet Corn and the amazing Peanut Butter Fudge ! As most of you know, I am a city girl born and raised. Living in PA I have had my fair share of visits to Lancaster. Lancaster, a great place to visit, see Amish culture and truly amazing Amish style foods. Have you ever tried Amish style foods? Oh there is nothing like it, they are so fresh and full of flavor. They are something everyone should try. Dutch Country Pantry Foods has a great selection of this type of food, that your family will love. I was able to try out a sampling of some of the winder items that they offer. Let’s start with one of my favorite items, the Peanut butter fudge. The fudge was a nice size, the size of a small cupcake. The smell was mouthwatering. An amazing peanut smell, that was intoxicating. My husband and I split the fudge, and we enjoyed it very much. The fudge was very fresh, and creamy. There was a real peanut butter flavor, and it was not too sweet. Just the right consistency and texture. One of the best fudges I have ever had in my life it was divine. The Wet-Bottom Shoofly Pie is something that many of you may never have heard of.. It is a simple pie that is made from molasses. The pie is wet and gooey on the bottom, but dry and topped with a great sugary crumbly topping. This is a pie I have not had since I was a little girl. When I was young my family and I would travel to Lancaster often and the Shoofly Pie was always my dessert treat of choice. Tasting the Dutch Country Pantry Wet-Bottom Shoofly Pie, just brought me right back to being a little kid, and enjoying this sweet goodness. My daughter had never tried the pie before, but I knew if she was anything like me, she would love it. So she could not wait to try it, and after she finished her dinner I gave her a nice slice. She did not know what molasses was so, she kept asking how it would taste, and I told her just to try it she will like it… Well I was wrong, she did not like it she loved it! She kept saying this is sooo good! My husband loved it as well, saying he had to step away from the pie before he ate it all. If you are a fan of pecan pie, just imagine this as a similar pie, but with no nuts and a much better topping. If you have a sweet tooth, Shoofly Pie is something you will love. 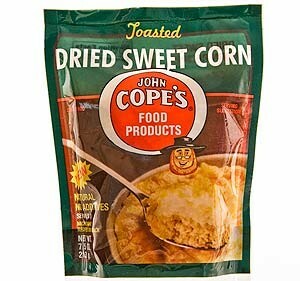 Last but certainly not, least is the Cope's Dried Sweet Corn. For me this was a great treat. I love corn cakes, corn casseroles, and corn fritters. Just about anything that has corn in it, scores high marks in my book. This dried sweet corn, may have a few steps to make the great looking casserole that is pictured on the bag, but I am sure this will be worth it. My family loves corn just as much as I did so we will love this casserole, a great addition to our father’s day get together next month. I would highly recommend Dutch Country Pantry Foods, it is your one stop shop for all PA Dutch country goodies. If you love homemade food, that is made with love and care this is the place for you. Or if you just love to try new and interesting foods make sure to give this place a shot, you will be glad you did. DutchCountryPantry.com offers a great shipping cost, the Flat Rate $10 FedEx Ground Shipping, and they offer free shipping on orders over $75, what a great deal! You can purchase anything shown here and much much more at Dutch Country Pantry Foods. Oh yum! How heavenly do these look? I've been looking for a great treat to send my grandmother and think I've found just the thing! Oh my gosh, these kinds of things were on the menu at a place I just ate at in Lancaster County. I would LOVE to have them at home too. YUMMY! Oh I love love love Dutch Country cooking. I had no idea you could order it. It may become my new obsession. Thank you so much for sharing.